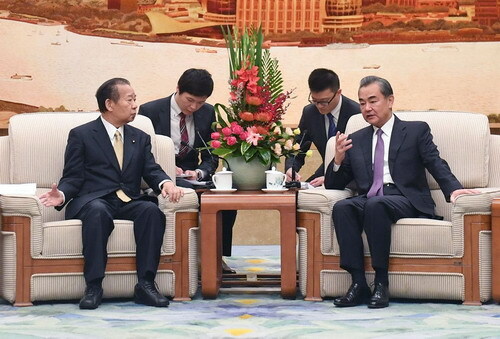 On August 31, 2018, State Councilor and Foreign Minister Wang Yi met with visiting Secretary-General of the Liberal Democratic Party Toshihiro Nikai of Japan at the Great Hall of the People. Wang Yi said that after years of twists and turns, China-Japan relations have returned to the track of normal development by taking the opportunity of Premier Li Keqiang's successful visit to Japan in May this year. This serves the fundamental interests of the two peoples and is the common expectation of the regional countries and the international community. This year marks the 40th anniversary of the signing of the China-Japan Treaty of Peace and Friendship, and serves as an important node that inherits the past and ushers in the future. First, the two sides should go back to original point and review how the leaders of the two countries handled the historical issues and the Taiwan issue, realized the normalization of China-Japan relations and maintained the political foundation for the healthy development of bilateral relations. Second, the two sides should stay true to the original aspiration, bear in mind the important mission of rebuilding the friendship between the two peoples and develop lasting, peaceful and friendly relations between the two countries. Third, the two sides should review the original commitments, and follow the declaration that neither Japan nor China seeks hegemony in the region, and that China and Japan will jointly oppose any other country to establish such hegemony. Whether it is military, economic or discourse hegemony, it does not conform to the trend of the times in the 21st century. Fourth, the two sides should keep pace with the times, actively expand cooperation in the fields of energy conservation, environmental protection and innovation, and jointly promote the construction of the East Asia economic community. It is hoped that Toshihiro Nikai, as a senior Japanese statesman, can make new contributions to the improvement and development of China-Japan relations. Toshihiro Nikai said that it is a hard-won outcome for Japan-China relations to go back to the normal track and obtain improvement and development. The Japanese side highly cherishes such outcome and is willing to work together with the Chinese side to safeguard the current positive momentum and promote the healthy and stable development of bilateral relations.